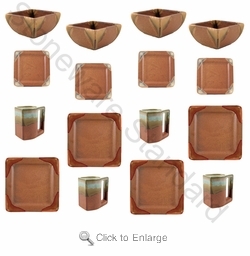 This crisp rustic brown Prado stoneware square dinnerware set comes with 16 pieces plus a mug tree for the four mugs. Notice the exquisite design on the four corners of the stoneware dinner plate, stoneware salad plate, and especially the stoneware bowl. This dinnerware set will set off any dinner table at meal time. Check out our Prado Replacement and Accessories Pieces to fill out your Prado Stoneware Dinnerware set.